Cat Ba Express bus - the best service bus Ha Noi to Cat Ba island. With Hyundai Universe Noble 34 seats Bring you up a journey comfortable. 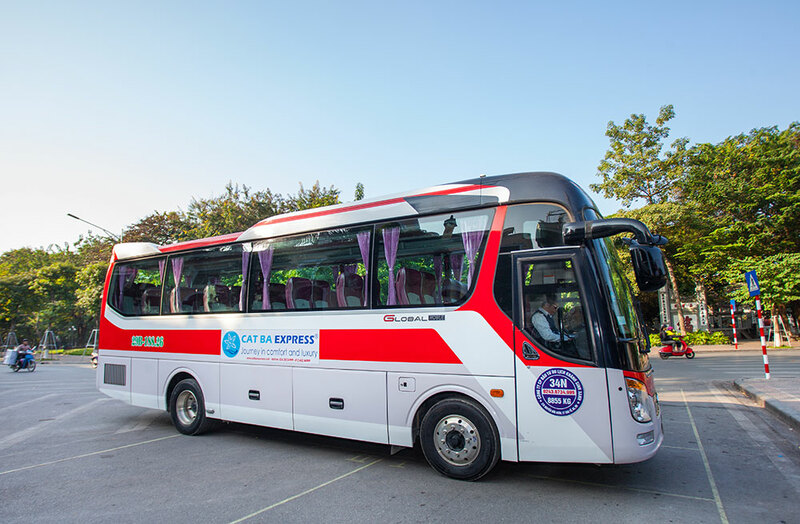 Cat Ba Express bus offer daily package transfer from Hanoi to Cat Ba Island with only a one-time purchasing ticket which makes your trip more comfortable and faster. With one combo package includes sharing bus speedboat, we will take care of all the logistic of your journey from Hanoi to Cat Ba island. Free pick up at your hotel located in Hanoi Old Quarter. If yours is not, please be at Cat Ba Express office 37B Nguyen Huu Huan, Hoan Kiem, Ha Noi. Departure to Got Station, following high way 5B ~ 2 hours. Get on the SPEDDBOAT (Not Ferry) from Got to Cai Vieng ~ 8 minutes. Transfer to Cat Ba Town by bus ~ 40 minutes. Drop off at your hotel (if yours is in Cat Ba Town or on the way). How long from Ha Noi To Cat Ba ? 27 USD ~ 566.000vnd/1 person/ round trip.